This is an important question, especially these days in a weak economy. The answer is not as easy as it might sound. The short answer is that it depends on the condition of the piano, and how much or how little service it has had since it was made. Pianos are made of many organic materials like wool, wood, leather and other materials which change over time in various ways. Felt and leather start out soft, and later become hardened. Wood can swell with moisture, and can twist and warp. Glue joints can fail under unusual circumstances like excess moisture or dryness. So, a piano may need more than just a simple tuning. In the course of time, the steel strings also elongate and lose their pitch. It takes several tunings for the strings to stabilize and hold the pitch for a long time. There is almost nothing that can be done about this except to begin a regular schedule of tuning every 6 months to a year. In addition to the stretching of the wires, there are the forces of temperature and humidity which act on the wooden structure. When the humidity rises, the strings are pushed to a higher pitch by changes in the humidity affecting the wooden soundboard and bridges. When the atmosphere gets dry, the opposite occurs and the piano goes flat. If the piano isn’t tuned regularly, it usually drops in pitch. The longer it isn’t tuned, the flatter it gets. After a span of more than a year, the piano will need more than a simple tuning. That’s because it will put an additional amount of tension on the strings than it has been used to. Bringing back the tension on the strings will add many tons of extra stress on the frame of the piano, even if the pitch is only 10% flat. The piano will need a rough tuning, or “pitch raise”, first. Then, when the tension is close to where it needs to be, a fine tuning can be done. If a piano hasn’t been tuned within the last year, it likely need both a pitch raise and tuning. My price for a regular tuning is $125, and adding the pitch raise will raise the price to $185. It is also possible that other problems may need to be addressed before the tuning can be done. I usually won’t tune a piano unless it’s in playable condition. If there are sticking keys or other issues, I might have to do some repairs or adjustments beforehand. Any extra charges will be added to the final bill. Really, it’s not much different from taking your car to a repair shop. How much work needs to be done must be assessed before an estimate can be done. If you find you need to sell your piano, there are some different avenues that you can take. Consignment Depending upon the value of your piano, it may be possible to consign it at a local piano store. If your piano is a famous brand like Steinway or Mason-Hamlin, a store may want to consign it for you. Be aware that they will take a sizeable commission for doing so. Read any consignment agreeement carefully so that you know exactly what to expect. Some agreements take a percentage of the sale price, and others will allow for a negotiated price, above which the store keeps the rest. Often a dealer may have to perform repairs, do regulation, and tune the piano to get it ready for sale. Find out if you will be responsible for paying for these services if the piano doesn’t sell. While it is up for sale, be aware that you won’t be able to give your friends or relatives a special price. Sometimes, a buyer might offer less than the asking price. The dealer may call you to ask if you’ll be willing to take less. Be sure to formally sign a revised agreement in that case. Your agreement is a legal document, but a phone conversation is not. Sell to a Technician If your piano isn’t a famous brand, and if it isn’t a grand piano, stores aren’t likely to consign your piano. In the past, some stores would outright purchase pianos for sale. I don’t know if this is still the case, but you can always ask. Some technicians purchase pianos to fix and resell, so calling around a few local technicians might be another avenue. I have done this a few times, but normally I don’t get involved in direct sales. I prefer to let real sales people do what they do, and I stick to tuning and repairs. Craigslist Nowadays, Craigslist is where the vast majority of pianos get sold. You have to expect that buyers are bottom-feeding, looking for a bargain. Indeed there are bargains to be had. That means that you may not get near top dollar for your piano. Plus the fact that there are so many for sale there, a cheaper piano price will sell faster than yours. You may want to have the piano serviced before the sale so that it will be easier to sell. Offer a free move (build this into the price. Call one of the piano movers from the referral page for a ballpark price for a move). You might offer a free in-home tuning (shameless plug here!) after delivery. 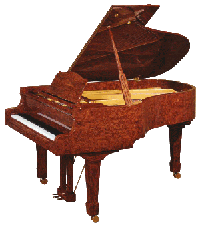 Online Consignment Websites There are also online sites that offer pianos for sale. Try www.PianoMart.com, or www.PianoWorld. Your piano will be listed by serious seekers, and there’s not as much competition there. There is a charge for listing them, but it may be worth it. The price must reflect the fact that a shipping charge will be incurred by the prospective buyer who lives far away. If you have a high-end piano or a valuable antique, this option may be advantagious to you. Rent your piano Another idea is to advertise your piano for rent. You might know a neighbor or friend who would be willing to rent your piano, or advertise it on Craigslist as a rental. You can call me for details on how to do this. Some repairs might be necessary, as well as a tuning. Maybe a “rent to own” agreement could be offered. If it doesn’t work out, you get the piano back, and keep the $$$’s. Make sure you include a disclaimer on any damage that might happen on the piano. Careful- don’t lose a good friendship over it! Donate It Lastly, a donation of your piano is a way for some less fortunate student to fulfill their dreams of owning a piano. Father Joe’s Catholic Charity, Goodwill, or other thrift organizations would love to get your donated piano. Be aware that they won’t take it if it’s junkyard material. It has to play and be in reasonable shape. Also, second-hand stores might be willing to consign or purchase your piano. Might be worth a phone call. So, good luck finding a new owner of your piano. It’s hard to let it go, but maybe you’re looking for a better one. Maybe you don’t have room, or you’re moving and can’t take it with you. If you get stuck, give me a call. Maybe I can help find a new owner in one of my clients. In lean times, we sometimes think of selling the family piano. Or, we decide that good pianos are much cheaper now, and why not replace the one I have for a better one? Maybe we need to update the insurance policy, and getting the piano appraised is suddenly a front-burner issue. That brings up the question, how much is my piano worth? Unfortunately, if you purchased a piano a few years ago, it might not sell anywhere near what you paid for it. Prices are generally down because of the glut of used pianos on various sites like Craigslist. This forces prices down on existing pianos because the piano we want to sell is now competing against them. Dealers also have been feeling the pinch, and so have been discounting prices lately to unheard-of levels. The upside is, prices for good pianos haven’t been this low for a very long time. So, how do we get to the bottom line? How much could my piano potentially be worth? And how could I best market the piano? First, you might look online at websites like Ebay and Craigslist for similar size and brands to the one you have. Unless you own a well known name like Steinway or Yamaha, Chickering, Knabe, Mason-Hamlin, Bechstein and other famous makes, getting top dollar is not going to be easy. You may find that sentimental value on your grandmother’s piano is a lot more than what you could sell it for. Next, you might have to have an appraisal done by a reputable piano technician. Having years of experience with different brands, working for local stores, buying and selling pianos, a technician may have an unbiased perspective on values. Of course, dealers are going to be the last place you might find an unbiased opinion, but since they know current prices, it wouldn’t hurt to call some of them for an opinion. If you are trying to get a valuation for insurance or estate purposes, a licensed appraiser is a safe choice. If you need a referral, call me or write me a note. Another resource is Larry Fine’s “The Piano Book”, which is a good reference book for pianos in general. Learning to judge a good piano from a mediocre one is important when it comes time to establish a baseline value. Comparinga Yugo to a Bentley is easy. Comparing two pianos isn’t so easy. In important legal matters, it’s always best to consult an expert. When it comes to taxes, don’t expect to be able to bribe someone for getting a high value for that old spinet that you donated to GoodWill. A reputable technician or appraiser is on the hook if his or her valuation is skewed. Don’t even think of it! I hope I have taken some of the mystery out of piano appraisals and valuations. It’s not an easy question to answer because of all the variables of age, condition, features, etc., which one has to carefully evaluate before coming to a conclusion. This can be easily remedied, but is often hard to find. There are many things that can cause a buzz or vibration in a piano. Buzzes which are obvious usually result from something that is sitting on the soundboard, mostly in grand pianos. Grand pianos have a heavy frame, known as the plate, which holds back the tension of the strings. It’s the gold colored frame with holes in it inside the piano. Often, toys, coins, pencils and other items find their way through the openings and rest on the soundboard. When you play a note, the soundboard vibrates the item and you hear a buzz. The sound usually lasts about a second or so. On upright pianos, over time, extension cords, toys, pictures and other things fall behind the piano and rest against the soundboard. Then you get buzzing sounds similar to grand pianos. These are the easy buzzes to find, since you can almost always find them by looking. Using a flashlight and a small mirror, you can see items on a grand piano soundboard, and upright pianos simply have to be pulled away from the wall to see what has fallen behind. The more difficult buzzes and vibrations are usually structural. 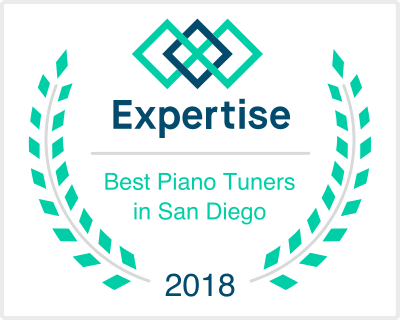 Old pianos often have loose glue joints, cracks in the soundboard, loose screws and other age-related problems develop buzzes that are harder to find, since they are mostly invisible. Cracks in a soundboard are not necessarily serious, but can cause problems because it can mean that the ribs are coming unglued. At this point, a technician must determine where the failure is, and determine how to fix it. Over time, the animal glues used in construction of the piano are getting dried out. Piano soundboards especially are under stress from the moment they are made. This helps transmit sound effectively. But when the glue begins to fail, there can be serious problems in the tone and sustain of the piano. Buzzes are often the indicator of failure of glue joints to remain tight. A third problem could be the path of the strings. Where they go under, over, around, etc., occasionally the sound gets “edgy”, indicating that the string itself is making a buzzing sound. On a grand piano, the dampers can rub against the strings if the alignment has changed. A good technician is needed to determine what the problem is and to do a proper repair. Lastly, items around the piano can vibrate in sympathy with the sound. Knick-knacks on a shelf, picture frames, even wall sockets and switch plates can cause buzzes if something is loose. These are very hard to find, because the sound bounces around. If you have buzzes, start by removing items from around the piano. See if taking them away makes the buzz go away. If so, you just found the culprit! In addition, loose screws in the action, case, lid or other piano parts sometimes get loose and cause buzzes. Tightening screws is the first step in searching for a buzz, and is sometimes overlooked as a cause. Ask me how I know! So, next time you’re hearing the ‘buzz’, you’ll know at least something about where to find it. If not, give me a call.